The Drought Tolerant Evergreen is our toughest plant. This tree will grow very quickly into a dense, impenetrable barrier that will block wind and snow and give you privacy from neighbours and roads. It is so drought tolerant that once established it needs no help from you at all, no matter how hot and dry things get. It grows so rapidly that within a very few years you will have a beautiful tough screen giving you the protection you need to enjoy your yard. The Drought Tolerant Evergreen also makes a great specimen plant in a lawn or in a low-water garden and it is very easy to grow, resistant to pests and diseases and can easily be trimmed to keep it at the height and shape you want it to be. If you live in warmer areas of the country you know how hard it can be to keep plants alive during dry periods. Even in areas not known for drought, dry periods certainly happen and they can cause havoc in your garden. So it makes sense to choose the most drought-resistant plants possible, to be sure they will survive whatever the climate throws at them. 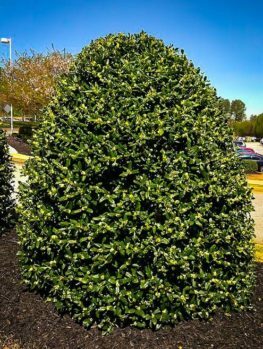 Our Drought Tolerant Evergreen is the answer when you are looking for a plant that will survive any dry spell and will thrive even in areas which have very little natural rainfall. Nature has made this plant for the tough climate of the south-west, so you can be sure it will thrive in even the most severe conditions. The Drought Tolerant Evergreen has many uses in the garden, but it is especially useful for a hardy screen and as a specimen tree. Grown as a screen, it will quickly reach a suitable height and develop into a dense barrier that will give you complete privacy and protection from strong winds. If you want a trouble-free, no-care-needed specimen tree then this tree is the answer. Not only will it make an attractive specimen but it has the perfect Christmas Tree shape, so it can be decorated each year to celebrate that season. Our Drought Tolerant Evergreen is hardy to minus 50F, so not only will it survive drought, it will take some cold too. It will grow well in zone 7 and even in the warmer parts of zone 6, right into the hottest parts of the country, although it does need some winter chill, so it will not do so well in areas like southern Florida. This means that all through the southern half of America and right up the West, this tree will thrive in the toughest conditions. 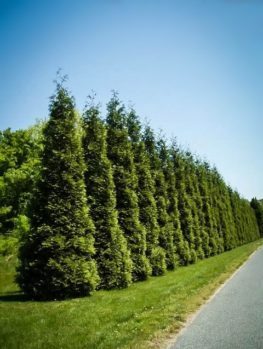 If you are looking for a hardy, fast-growing screening evergreen for colder areas we recommend Thuja Green Giant. 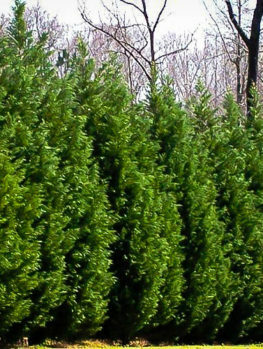 For very cold regions Thuja Emerald Green is the best choice, as that tree will grow happily with winters of minus 400F. 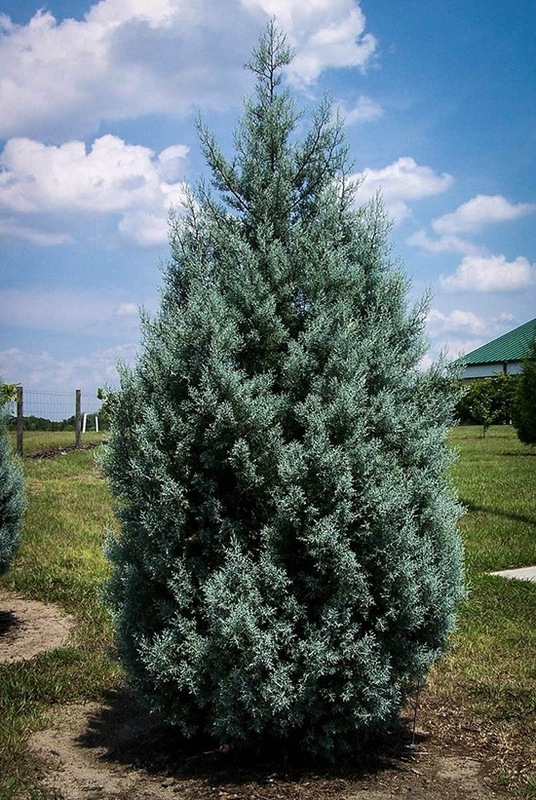 Our Drought Tolerant Evergreen is a special type of Cypress (Cupressus arizonica) which grows naturally in Mexico and the south-western states. In Arizona there is a particular form of this tree growing wild, and in 1968 a special selection was made from some seedlings of this Arizona form. This unusual seedling had very lacy foliage of a gorgeous steel-blue color, which made it very special and attractive. It was given the name ‘Carolina Sapphire’ by the growers, who were at Clemson University, South Carolina. 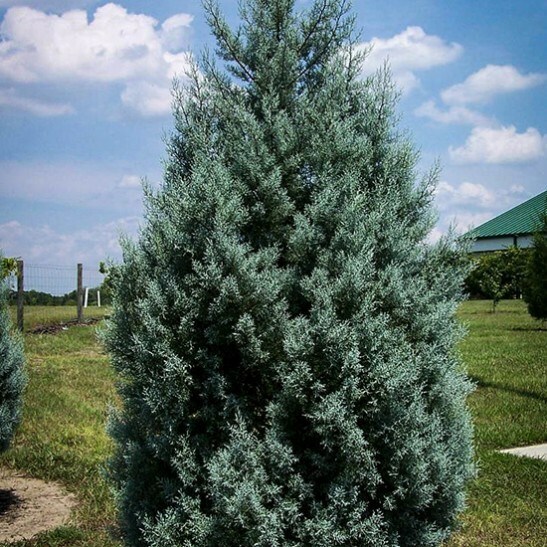 This tree combines all the toughness of the common Arizona Cypress with a soft appearance and a very beautiful color. 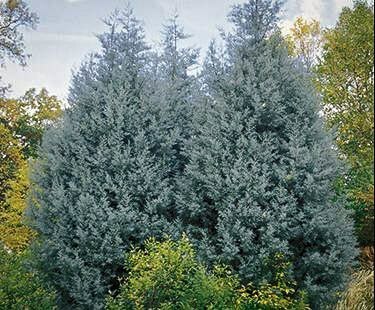 The Drought Tolerant Evergreen is one of the fastest-growing evergreens and it can grow as much as two feet a year when young. It will quickly reach 20 or 30 feet in height if left unclipped. When mature it will be 8 or even 12 feet across, so plant your specimen tree far enough away from buildings to leave room for your tree to develop into its full beauty. 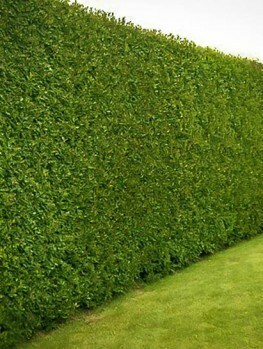 If you are going to clip it into a screen or hedge, then of course it can be planted closer to buildings, fences and walls. The foliage is soft and very fine, of a beautiful steely blue color, and it smells delicious, like a cross between lemons and mint. Unclipped trees will produce round, woody cones about an inch across as the tree matures. 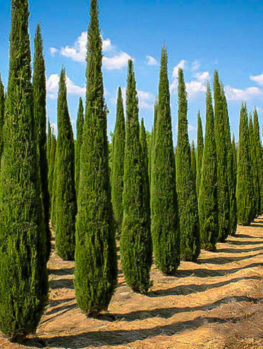 It is resistant to pests and diseases, especially the deadly Cypress Canker, which does not affect it. Combined with drought tolerance this really is a completely trouble-free plant that will work hard in your garden. 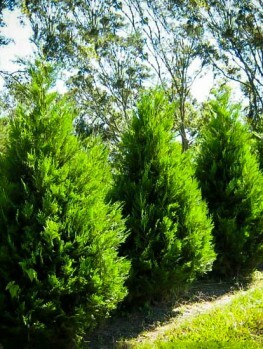 Our Drought Tolerant Evergreen is a specially-selected form and must be produced in the correct way. Our trees are produced from branch cuttings from the original form and cannot be compared to cheaper seedling plants that do not have the same properties and will only be a disappointment. By growing from branch cuttings each plant is identical and makes a beautiful, even effect when grown as a screen. Choose a sunny location to plant your Drought Tolerant Evergreen. It prefers well-drained soil and will tolerate even poor, stony soils. 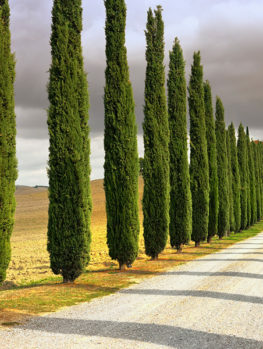 For a screen plant the trees 3 or 4 feet apart in a row and for a denser screen sooner, plant 4 or 5 feet apart in a double row, staggering the plants in the rows, which should be 3 feet apart. For an attractive landscape group plant three or 5 trees around 6 feet apart or plant a single tree as a beautiful specimen. It can also be planted in a large pot or container as a specimen for a terrace or deck, where it can be left to grow naturally or clipped into different forms. Dig a hole three times the diameter of the pot and place your tree at the same depth as it was in the original pot. Place the tree in the prepared hole and put back most of the soil. Firm the soil well around the roots and fill the hole with water. When all the water has drained away from the hole, replace the rest of the soil. Water your trees once a week during the first year and after that watering will not be necessary at all. For the most rapid growth, use an evergreen fertilizer in spring and water well just once shortly after putting down the fertilizer. Our Drought Tolerant Evergreens are true to the correct form of this amazing plant and we always give you the best plant for your purpose. However we are constantly receiving new material so that our customers get the best and healthiest plants, so supplies of this very popular tree may be limited. To avoid disappointment order right away.